Located at the head of Port Phillip Bay, Melbourne is Australia's second largest city. It's also considered the cultural capital of the country and has a lot to offers travelers. The architecture is interesting, the shopping is excellent, and there are plenty of museums, galleries, and theaters throughout. If you're traveling on a budget, hostels will offer the most social atmosphere at an affordable cost. Melbourne has a good number of decent hostels that are in convenient locations and offer some nice amenities. Perfect location with plenty of great amenities! The Greenhouse Backpacker Hostel is located right in the CBD of Melbourne in the cafe district. Most guests claim that the location can't be beaten! Within walking distance to Flinders Station, Federation Square, the free tram, and a number of shops, bars, and restaurants, the location is convenient for seeing everything that Melbourne has to offer. Regularly scheduled activities are planned to help guests get to know each other, make friends, and see the city together. The hostel is clean, modern, and full of great amenities such as a kitchen, large common areas, lockers and storage, free tours, and helpful staff. Dorms are available in various sizes for women, men, or mixed genders. Free breakfast is offered to guests every day, along with free coffee and tea. Wi-Fi is also free, as well as computer usage, and the hostel has coin laundry and other typical conveniences for budget travelers. A good option for small groups of friends. United Backpackers is a favorite hostel for travelers to Melbourne. The hostel is conveniently located across from Flinders Street Station, which is in the heart of the city. The hostel is clean and modern and has many places for guests to relax and hang out. There's a bar in the basement that is social and fun. The hostel itself is decorated with an eclectic decor that keeps the atmosphere light and fun. Other amenities available to guests include free wi-fi in the common areas, a kitchen and dining area, security lockers, laundry facilities and travel information and bookings. There are plenty of common areas where guests can hang out including the bar area, the dining rooms, and a television lounge. It's not hard to meet other travellers and make a few friends while you're staying here. The hostel is large and has space for 280 travellers. Room options include either twin or double private rooms or dorms. Dorms range in size from four beds to twelve beds (and everything in between). Both female only and co-ed dorms are available. If you're looking for a modern and fun place to stay that appeals to all types of travellers, then the Space Hotel is a good option. It's both a hotel and a hostel with both dorms and private rooms available. The Space Hotel prides itself on offer luxury style accommodation at an affordable price. 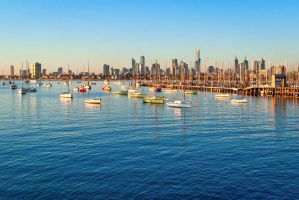 It's located between Melbourne's central business district and Lygon Street, which is where you'll find many of the city's best restaurants and bars. Space Hotel was designed to offer guests all the best amenities regardless of their budget. The rooms are modern and well furnished. There are flatscreen tvs in each room and guests have access to a gym, lounge, and cinema. There is also a game area and a restaurant on-site, the Blue Moon Bar & Restaurant. Rooms are either dorms or private. Dorms sleep either four, six, or eight guests and have security lockers, reading lights, and comfortable mattress. Single, private, twin, and double rooms are available as well. You can also choose between shared and private bathrooms. A good hostel for long term travellers. Tram Stop 14 Backpackers is located on Brunswick Street in the middle of Fitzroy. It's conveniently located near all that the neighborhood has to offer. It's near Melbourne Cricket Ground and Rod Laver Arena. It's also just a short walk from the Royal Exhibition Buildings and the Melbourne Musuem. The area is known for it's multicultural history and bohemian character and there are many great restaurants, cafes, and live music venues in the area. The hostel is small but social and it's a great place to meet other travelers. It really has the feel of home and makes a great base to explore the city. The hostel has dorms that sleep four, six or eight people and there are private single and double rooms available. Rooms are simple but clean and comfortable. Guests can also enjoy a full kitchen where they can prepare their own meals. There are several common areas in the hostel that guests enjoy lounging in as well. Also located in the Fitzroy area, the Nunnery is a charming hostel that's located in an old building. The building dates back to 1888 and has several impressive features including grand staircases, stain glass windows, and pleasant outdoor balconies. It's a nice place to stay for a few days and it has a lot of character. The hostel also has a social atmosphere. The staff hosts a number of different events throughout the week. Every Wednesday is soup night when one member of the staff prepares soup for the guests. Thursday nights are pub crawls that explore the Fitzroy area. Every Friday afternoon there's a barbecue in the courtyard and pancake breakfast is served on Sunday mornings. Both private rooms and dorms are available. Single, twin, and double private rooms are available and dorms sleep four, six, eight, or twelve guests. Female only and co-ed rooms are both available.